BREAKING! We are posting this the moment the embargo lifts on Rebecca Sudore's Prepare trial. As most of you know, Rebecca Sudore, MD, Professor of Medicine, UCSF Division of Geriatrics, is a giant in the field of advance care planning, particularly among diverse older adults with low health literacy. We talked with Rebecca about the results of The Prepare Trail, a randomized controlled trial of an easy-to-read advance directive PLUS a web-based decision aid vs the easy-to-read advance directive alone in 414 older veterans with chronic disease. You can view (and use!) the web-based decision aid at www.prepareforyourcare.org (in English and Spanish). The outcome was medical record documentation of new advance care planning (directives, POLST, discussion) assessed over a 9 month period following randomization. Links to the podcast and a transcript below (for those who prefer to read). 51% of veterans had evidence of advance care planning in the medical record. The VA is doing a decent job! In the 9 months after randomization, rates of NEW advance care planning were 35% in the easy to use advance directive PLUS video decision aid arm compared to 25% in the easy to use advance directive arm alone. That's just the documentation rate in the medical record. Upwards of 80% in both groups reported engaging in some form of advance care planning after the start of the trail. The intervention was directed at patients. It was up to patients to bring this up with their doctor on the next visit. The literature is replete with failed studies that try to get clinicians to improve rates of advance care planning documentation. That rates of new documentation were this high WITHOUT targeting physician or the health care system is pretty remarkable. Rebecca places this study in the context of the clinical reality, "You know, and as a geriatrician who sees patients in clinic and as a palliative care physician who sees people in the hospital, I think, many clinicians know the form's only as good as the discussion that goes behind the form. And that, especially in geriatrics and people dealing with serious and chronic illness, they're not dealing with just the one or two decisions that are on a form. They're dealing with many decisions. They and their family are wrestling with many decisions over time. And so it became clear in talking to patients and their family members that they needed some preparation for medical decision making. They needed some help. And a form in and of itself wasn't going to do it." Enjoy! (Bon Iver has a high voice, OK? I'm just sayin'). Alex: We have a special guest today from our own division, Eric. This is Rebecca Sudore who is a professor of medicine here in the Division of Geriatrics at UCSF. And she's here to talk to us about a groundbreaking study that was released today. This is a randomized trial of PREPARE for Your Care. Eric: And you're also today giving a talk, just a plenary talk on this, is that right? Alex: So we usually start off by asking our guests for a request and I know that we emailed back and forth. Any suggestions? What are you choosing here? Rebecca: But you told me you didn't know how to play that. Alex: Well, no, I could play it. (laughs) Let's clarify. But I needed a giant gospel choir behind me in order to pull it off. Rebecca: Oh, yeah, Eric didn't want to play the gospel choir, so we're going to do "Skinny Love" by Bon Iver. Alex sings “Skinny Love” by Bon Iver. Eric: So tell us a little bit about this paper that just got published. Rebecca: It was a randomized trial comparing two easy-to-use advance care planning tools. One was an easy-to-read advance directive and the other was the prepareforyourcare.org web site. And we found that by providing patients these easy-to-read tools, not only were they able to increase their engagement in advance care planning, such as have discussions with their family and friends, but over a third of them wound up putting their medical wishes into the medical record. Eric: Wow! Well, before maybe we take stab at some of these results and what you found, let's maybe take a step back. The easy-to-read advance directive, is that the easy-to-read advance directive that you also created? Now, how long ago? Rebecca: Yeah, it's been... wow, over 10 years. Rebecca: Yeah. I would say that I've probably spent the majority of my career trying to design and create materials to help people make more informed decisions. And I think advance care planning definitely is one of those areas where I think people need a little extra help. And so realized that there really weren't very easy-to-read advance directives out there. Most of them are written in difficult-to-read legal language. And they're scary and they're hard to read and that could be a reason why people didn't engage in them. So about, I guess, maybe it was 10, 11 years ago now, we created an easy-to-read advance directive that's written at a fifth-grade reading level. It has pictures that help describe the text. It's in English, Spanish, and about 10 other languages. And we had done a randomized control trial at our county hospital in San Francisco in English and Spanish and show that people not surprisingly prefer this easier-to-read form, were able to complete it. So that's sort of where all of that started. Prepareforyourcare.org. Tell us a little bit about that Web site. Eric: It didn't just fix everything? Rebecca: It didn't fix everything. You know, and as a geriatrician who sees patients in clinic and as a palliative care physician who sees people in the hospital, I think, many clinicians know the form's only as good as the discussion that goes behind the form. And that, especially in geriatrics and people dealing with serious and chronic illness, they're not dealing with just the one or two decisions that are on a form. They're dealing with many decisions. They and their family are wrestling with many decisions over time. And so it became clear in talking to patients and their family members that they needed some preparation for medical decision making. They needed some help. And a form in and of itself wasn't going to do it. So we did a lot of focus groups with patients and surrogate decision makers, people who had to make decisions for themselves and ask them what worked well and what kind of support did you feel like would have been helpful? And we took actually those stories that we heard from patients and surrogates and put them right into the PREPARE Web site. Eric: So what is PREPARE for Your Care now and what can people expect if they go to the Web site? Rebecca: We really wanted to create something that wasn't just education and information like "you should do this." I think a lot of people know they should do it; they just don't know how to do it. So we really wanted to make sure it was easy to understand and showed people how. So easy to understand, also written at a fifth-grade reading level, also in English and Spanish. And then the cornerstone really are these videos that show people how to do something. So how to choose a surrogate, how to start these conversations, how to ask your doctors questions. There's five steps to the Web site and it walks people step by step through that process. And as people are going through, they can answer questions about their values and their goals. And then they get this printout that they can use to spark discussions with their clinicians and their loved ones. Eric: So back to the study, so can you tell us a little bit about who you studied in this randomized trial? Rebecca: Yes, so these were veterans at the San Francisco VA. They were from multiple primary care clinics. They were over the age of 65. And they were included if they had a primary care provider and they were seen in the clinics at least a few times in the recent year. Eric: And this was a diverse group is my understanding. Rebecca: This was a diverse group. I remember correctly close to 50 percent were from diverse backgrounds. Eric: Mm-hmm (affirmative). And being a VA was mostly men. Rebecca: It was mostly men. So there were nine percent women. We tried to over sample. And I think at our San Francisco VA it's about four percent in general. Eric: Okay. And you compared what to what? What were the two arms of this trial? Rebecca: Yeah, so one group got the easy-to-read advance directive. And the other group got the easy-to-read advance directive and the PREPARE Web site. Eric: So it was an active control group? Rebecca: It was an active control. This was a comparative effectiveness. Everybody got something. Eric: So there was no usual care here? Rebecca: There were no usual care. Eric: So if you looked at their baseline, how many people actually had advanced care planning discussions? Rebecca: So what we found is that about 50 percent of people had any kind of evidence of advance care planning in the medical record before. And when you look at the national average, that's telling you -- the VA is actually doing a pretty good job. I think what we found, however, is that the mean time of those discussions and/or forms were five years before. And when you think about people change, people's clinical context change, and we often say that people should update their advance directives at least on a yearly basis. One of the reasons that we didn't exclude those people is because we wanted to give people the opportunity to update their information. 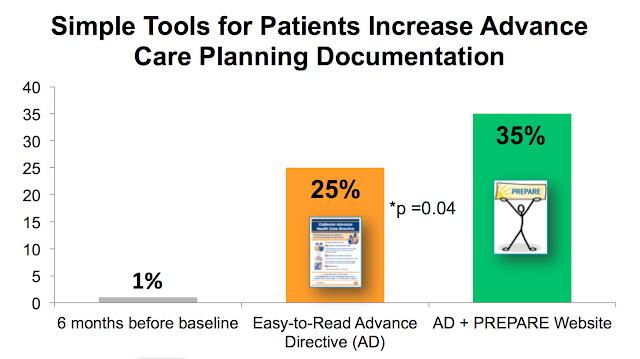 And it's also one of the reasons why our primary outcome was looking at new advance care planning documentation to see did these tools help people do new advance care planning? Eric: Right, right. And so what did you find? What were the major findings? Rebecca: Yeah, so our major findings were that over 80 percent of people in both groups engaged in some form of advance care planning. When we looked back at the advance care planning rates six months before this study for the cohort, the advance care planning documentation rate was actually less than one percent. But the group that just got the advance directive had an increase to 25 percent of documentation in the medical record. And the group that got PREPARE and the advance directive had a 35 percent increase. And that difference was statistically significant. One of the other things that we found is that that's just documentation. But that doesn't include all of the other discussions and conversations that they were having. And people who got the PREPARE Web site also, sort of -- to have these conversations and felt more prepared to have them. Eric: But it was up to the participants themselves to bring the materials that resulted from the PREPARE Web site to their clinician, is that right? Rebecca: Right, right. And we timed the intervention so that it was about one to three weeks before their primary care visit because we wanted to give people the opportunity to bring it in. We did have a reminder wherein the control arm we reminded them to go see their doctor and in the PREPARE arm, we reminded them to see their doctor and to bring in any of their materials that they wanted to their doctor. So there was a little bit of a reminder there. But it still, again, was up to the patient to decide whether to bring it into the clinic and then whether to bring it up with their doctor. Eric: So the research staff never actually contacted their physician providers. This was all real life. Rebecca: Right. And I think that's also an important point. We did nothing with the clinicians except get their permission to recruit their patients. We didn't tell them about the interventions. We didn't give them the interventions. We did no training. Rebecca: That's a really good question, Eric. So the Web site is free to the public and the advance directives can be downloaded from the Web site. Clinics can download our easy-to-read advance directive, can download the PREPARE pamphlets, can put a link to PREPARE in their materials. UCSF actually has the ability to do licensing with any organizations who would like to incorporate these materials into clinical programs, who might want to what we call white label or brand the information for their organization, and who might want to integrate some of these things into their electronic medical record. There are groups that have licensed from us because they want to know which patients are coming and to get a report back about how good they're doing in advance care planning. So there are licensing opportunities. Eric: So it sounds like if I'm a patient, I can use it for free; if I'm a large organization, I should probably license. Eric: Great. Now, putting this study in the larger context of advance care planning, you have your finger on the pulse of what's going on in terms of advance care planning nationally. And we've interviewed some folks who are involved on this podcast including Angelo Volandes at ACP Decisions. * There's video advance care planning. Laura Hanson, we interviewed for a podcast about her video advance care planning in dementia and nursing homes. How would you situate PREPARE and the easy-to-use advance care planning in the context of all of these really interesting innovations that are going on nationally? Rebecca: I do want to say that all the people that you mentioned are good friends of mine. It is a really exciting time because I think more people are starting to think about advance care planning and there are really amazing innovations out there. I want to talk about the Conversation Project, which also has a very community-based focus. Rebecca: POLST, the POLST group. I love Angelo's videos. So I think that there are a lot of materials that people can use. I think maybe what differentiates PREPARE and these materials is the fact that they are available to the public. They're easy to use, so they're targeted to a range of literacy levels. And I would say for something that can be a charged topic for some people, we've made it so that it's approachable, it's not scary, it's easy to understand. It's also in multiple languages, so it's in English and Spanish. We've translated the materials into Chinese, but we're looking for funding to be able to provide the information in Mandarin and Cantonese. So I think it kind of helps with the language piece. The other part of it, too, is that not only is it evidence-based, which I think is an important piece, but we've really gone out of our way to design these materials with and for the community. So at every single step of the way in terms of our development, we include people from diverse backgrounds to give us help to make sure that what we're giving to people is culturally appropriate. So I think that that's where it can fit in. Eric: Yeah, that's true. So what's next? Rebecca: Oh, there's so many things. So first of all, we just launched our new Face page, which is sort of exciting. We have a little video montage in the beginning that kind of tells people a little bit about what PREPARE is. And we've launched in the new Face page a resources section so that people can download these pamphlets and the advance directives. Some of the other things that we've been doing are we've tested PREPARE in group medical visits. Being able to use -- again, it doesn't necessarily have to be a physician, it could be ancillary staff because all the information in PREPARE is there. I'll step back and just say people can go through PREPARE in an interactive way, clicking through the buttons, answering questions. And then all of that content can actually be wrapped into a movie and that movie can be played from start to finish, or it can be played one step at a time. But what that allows people to do is that even if you have no training in advance care planning, you can put on a group. You can put that group on in a clinic setting. We've been sending it out and people have been using it in senior centers, libraries, places of worship. And you don't have to have any training. And we've created toolkits so that people can just take the Web site and it has everything in there from how do you send out an email newsletter about your event, how do you start the process? How do you click the play button on the Prepare Web site? It just really walks people through that. So our goal really is to try to disseminate and to get the information out to as many people as we can. Eric: So there's a lot of activity going on as far as reform of health care. Eric: There's a little bit of activity. (laughter) There was a bill passed, something American Health Care Act or something. We'll see where it goes. But in any case, there's a lot of interest in reforming existing legislation, which is colloquially called Obamacare. How does what you've done in PREPARE fit in with health care reform? Rebecca: There's a lot of work that needs to be done to fix the health care system. That is for sure. But I think we can say that no matter what your politics, we all want to have a voice in our health care. And advance care planning is a really powerful way for people to take control of their health. And it's really critical to ensuring that people get the care that they really want. And I think we found in this trial that really using easy-to-use tools, even with minimal input from the clinical system, can really empower people to engage in this important process and really prepare them and their families for advance care planning. So my hope is regardless -- I think you both know how I feel about things -- but regardless of where things fall that advance care planning is still really important. Eric: So what's the one thing that you want our audience to remember? Rebecca: Well, I think that there are these easy-to-use, free materials that we've shown really help people engage in advance care planning, are non-threatening and they're a way to help people have a voice in their own health care and to prepare their family and friends. So they're out there in the public. And again, we really want to just get them out to as many people as possible. Alex: Get the word out. If you're listening, spread the word. Go to prepareforyourcare.org. Check it out. Eric: Let's end with a little bit of music. Alex: Tell your friends. I'm going to pull my pants up to get these high notes. Alex: You're going to join in? Eric: (sings) I've never heard of this song. *Correction: Angelo Volandes is founder of ACP Decisions, not Vital Decisions. I agree wholeheartedly with the premise of advance care planning.